Today I want to tell you about two places where you can get winning racing tips. One is free the other is looking like excellent value for money. The free is the Betting Insiders Friday mail which each week contains a tip for the Saturday TV racing. 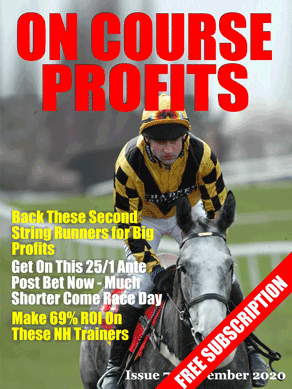 These tips are on great form with 58 points profit from just one sometimes two Saturday bets. That's only 12 bets so far this year and 58 points profit, thats a 483% return on investment! Click Here to get on the list for those bets. The second service is run by the guy that provides 70% of the bets for the Friday. This guy has had an amazing Cheltenham! He tipped Western Warhorse on day 1 at 50/1 the SP was 33/1 followed by Jezki at 10/1. He then tipped More Than That to beat Annie Power at 10/1, he duly obliged with an SP of 15/2. And Tatenham each way who placed at 40/1 advised 33/1 SP. On Friday he gave Tiger Roll at 10/1 and Lord Windermere advised at 33/1 who won the Gold Cup at an SP of 20/1. That was from just one selection per race, so 27 bets returned 117 points. The run continued on Saturday with the winner of the Midland Grand National advised at 8/1, SP 13/2.